The ninth Vusumzi Primary School classroom is dedicated to the Yates family, whose devotion to Universal Promise is a family affair. It began in 2011 when Joe Yates, then a junior in high school, proposed bringing electricity to an informal settlement UP served in South Africa. Several months later, the entire family found itself on-site while Joe enjoyed an internship at a Port Elizabeth, South African company that focuses on green energy systems. Following his one-week stint at Kestrel Renewable Energy, Joe and his family traveled north to Addo, where he oversaw the erection of a wind turbine that has now powered a nursery school and a community center for years. As a 13-year-old watching her older brother change lives, Jenny started planning her project for when she came of age. 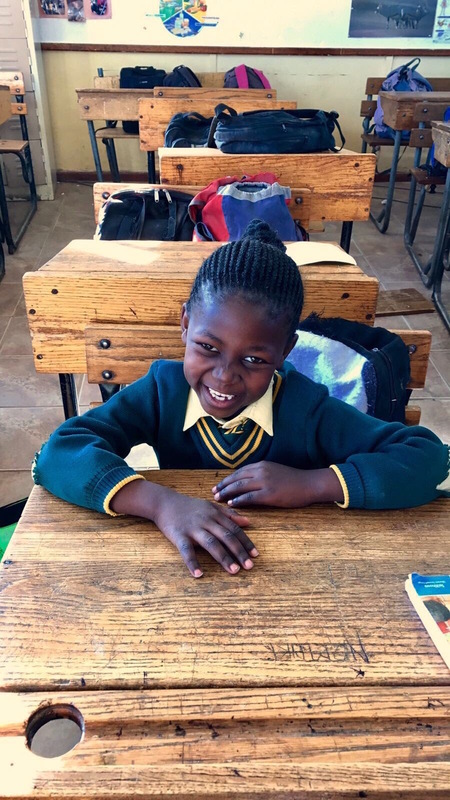 She opted to build an outdoor classroom for 100 kindergartners in the nearby township of Nomathamsanqa. Jenny collaborated with American teachers and South African educators to design and oversee the construction of an enormous "playground" that emphasizes physical, intellectual, and social development. The space, which includes a small version of a netball court and soccer pitch, vegetable gardens, two swing sets, a sandbox, racetracks, hopscotch grids, and a pretend market and clinic, is a symbol of the re-birth of Vusumzi Primary School. Its position in full view of passersby reminds everyone of the importance and the wonder of play. As Joe and Jenny carried out their efforts, parents Gail and Ted were by their sides, working intimately with the Xhosa population to bring impactful and sustainable initiatives to local schools. Gail and Ted also rolled up their sleeves as they grew enamored of the resourcefulness, warmth, and music of their South African friends. Gail and Ted continue to show their devotion to UP by attending all fundraising events, helping to set up and clean up at all such gatherings, offering auction items that have brought in several thousand dollars, and much more. The Yates family truly values education and the role it plays in achieving independence and nurturing confidence. UP is grateful for their collective commitment and for the sacrifices they continue to make on behalf of our mission of education for all.